The presentation of the subject was clear and to the point. Content was interesting to me. The materials held my attention. I can use this information in my practice. This program met my personal expectations. Overall quality of course content and materials were excellent. Define secular ethics and what it means to enjoy mutual tolerance and respect for all. Discover the elements of a shared human experience: identity, perspective, equality, empathy and suffering. Explain the role of discernment in creating our own inner value system and generating our own personal level of ethical awareness. Examine the role of ethics in our shared world by discussing concepts of cooperation, the culture of violence that exists, personal disarmament, the environmental crisis and the needs for education of the concepts of ethics. Analyze key inner values of patience, forbearance, contentment, self-discipline and generosity, consider how they impact our system of ethics and integrate these values into our practice. Discuss the purpose of diversity training as it pertains to the massage therapy industry. I enjoyed this course and really did get a lot out of it. I like how you have made ethics more interesting and continue to keep mixing it up. I really appreciate the book Beyond Religion and how ethics is explained w/o so much religious talk (coming from the Dalai Lama) and I will continue to read this book as I feel this is a good reminder of simple things to appreciate in life. We all can practice gratitude. I will share this with others. This class was delightful and far better than I imagined. The study of ethics has always interested me but this was right up there in the top 3 classes I've had and the other 2 were live discussion classes. This was the best on line course I've taken! Not sure your other courses will measure up as the text for this was written by the Dalai Lama! Most texts for on line courses are too easy, talk down to the reader, not detailed enough and not adequately challenging. This one was a real winner. Thanks so much for having an impact not only on my practice but on my general existence. This was a WONDERFUL ethics course! Interesting, heart-warming, and full of lots of things to mentally chew on and digest. Would be great in a classroom setting as well. I've learned quite a lot and will be returning to this book over and over again in the future. This is a wonderful book for anyone to connect with their core values for personal and professional practice. I appreciate this text being offered. It's something I would be interested in, but without it falling into the category of fulfilling an ethics requirement, I might not have read it on my own. I am glad I read it, and having the exam questions available definitely made me study the information more closely. It would be great if everyone took the time to read this book, honestly. I enjoyed reading the Dalai Lama's book! Thought provoking. And he included meditations. I was very happy with the course overall. I believe this course exceeds 4 hours of study, but I definitely enjoyed the book and I think everyone should read it! Well developed course and test. This is an excellent practical, east to understand explanation and manual for mindful and compassionate living. It was well written, and easy to understand. Very informative! This was a great book. I am glad I read it. The test further engaged me so the information became more deeply absorbed. The text chosen for this class was beyond appropriate, timely and fascinating. I will cherish my copy and apply the principles I learned from it to my personal and professional practice. I very much enjoyed the text that went with this course. The Dalai Lama's book is an excellent choice. I love his writing, and his strong argument that ethical living does not have to be tied to a particular religion, or any religion at all. I am so grateful for an ethics course that comes straight from the heart. Thank you. What I learned will stay with me a lifetime. Loved this course. I'm recommending it to everyone! I thoroughly enjoyed this course! Reading the book that the course is based on was like spending a whole day with Dalai Lama! I am excited to take more book-based courses through the Institule in the future! Thank you so much! This is a beautiful course! The Dalai Lama describes an approach to ethical behavior that would make the world a better place for everyone,as well as the Earth, if it were universally embraced. Thank you for offering this enlightening course! Loving the ethics with Dali Lama. I also read his Ethics for a new millineum. Would love to have other spiritual teachers for our CE's. Thank you! 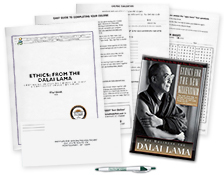 I very much enjoyed studying ethics through the teaching of the Dalai Lama and am grateful to have the opportunity to fulfill my massage therapist license requirements with such useful material. The information is helpful for my practice, but also for my life overall. Thank you! I really enjoyed reading the book Beyond Religion by the Dalai Lama, even if it wasn't required for this course. Your courses are always valuable and enjoyable to do. I thought this was great....Beyond Religion by the Dalai Lama was an amazing read and kept me engaged with the book the entire time...I was able to relate and apply things from the book to my practice and my personal life. The test was to the point and helps you learn as well. A few years ago I took the Ethics course based on "Ethics for the New Millennium" by the Dalai Lama. I thoroughly enjoyed it. I was thrilled to see another Ethics offering based on the book "Beyond Religion-Ethics for a While World". It did not disappoint. 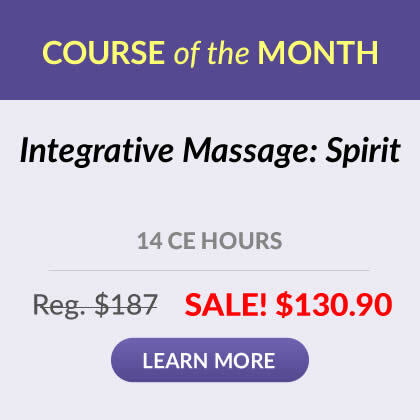 This course is relevant not just to massage therapists but to all people. It should be mandatory to graduate from any school of learning! Loved the course on Ethics of Diversity, an area of ongoing research that is near and dear to my heart. The book, Beyond Religion was fantastic. When I first opened the package of materials and saw the book by the Dalai Lama, I thought I'd been mailed the wrong study course. Then i realized it was the correct one. I was thrilled! I've read several of his books, but was not aquainted with this one. The whole contect was right on for me. His excellent presentation and clarity of thought made it easy to comprehend. It was indeed a deliht to read. The test questions helped me to focus on the books contect. I am truely delighted with the overall experience. I'm going to loan the book to a friend of mine who's trying to learn meditation. She'd also read some of his books. Thank you thank you thank you. The Dalai Lama is an excellent writer, and I always enjoy his books. Thank you for including his latest work as one of your courses. Display Certificates suitable for framing are available for $10 in addition to the certificate included with your tuition. Click here to order a Display Certificate. 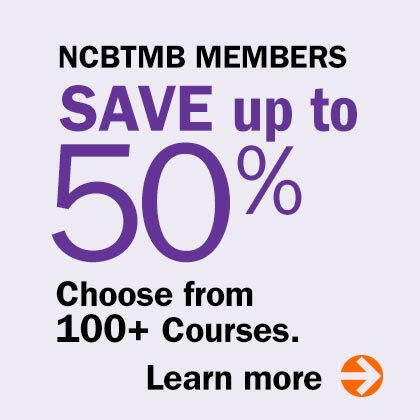 The Institute is approved by the National Certification Board for Therapeutic Massage and Bodywork (NCBTMB) as a continuing education Approved Provider. Approved Provider 049478-00. Credits also accepted by the AMTA, ABMP and NAHA. For information regarding your specific state massage license requirements and approvals, visit our Massage Therapy Continuing Education Requirements page by clicking here. You'll also receive original massage articles and exclusive offers. Rest assured, we will not rent your email to anyone. Receive original massage articles you'll love to read and exclusive offers you'll want to use. To be able to read the course content, take a quiz, have it graded immediately, and be able to print a certificate all online is fantastic. Thank you. The Institute for Integrative Healthcare Studies is approved by the National Certification Board for Therapeutic Massage & Bodywork (NCBTMB) as a continuing education Approved Provider. Our courses are also accepted by AMTA and ABMP. Online materials and/or tests can be accessed 24/7 at our secure, easy-to-use website. These 2 offers are not valid on prior enrollments and cannot be combined with each other, Product of the Month, or other offers. You have one year to complete each course after enrollment.